There is a bit of a give away in the title of this book as to what it's about, and for whom it is designed. Which is very useful, as if it had been called "My Life as an Astronaut", it may not have� well, you get the point. Bearing in mind that you can guess what the book's about, then I�ll just give you a brief outline of the plot. Microsoft SQL Server 2000 is the latest and most powerful version of the application that offers database solutions, interactive development tools and the complete management of applications. Beginning SQL Server 2000 Programming walks you through the complete process of developing a database, providing systematic instructions and demonstrations from an example database. Starting with the basics, such as choosing and installing the correct version, and running right up to more elevated techniques, like creating triggers, this book provides you with a sound comprehension of the most significant features. It is designed for novice programmers who are familiar with applications such as Access, but are interested in learning how to develop solutions with SQL Server, for instance, the basics of Transact-SQL. It also demonstrates some of the basics of SQL Server administration. This being the case, if you have already mastered the administration side of SQL Server, then you might want to skip the first few chapters. The style of the book is tutorial-based, but rather than offering just one route through, it covers the same �problems� from various angles, so you can choose the method that is appropriate to you. 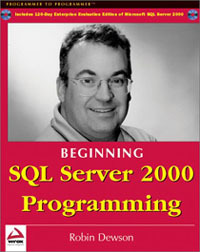 Beginning SQL Server 2000 Programming is written in a professional, but easy to read style, and includes a 120-day enterprise evaluation edition of Microsoft SQL Server 2000. That guy looks like Ian McAskill - The weather guy!! !